Aerial view of Tarpon Lake in Big Cypress with frolicking swimmers. This short day hike was organized by the Happy Hoofers chapter of the Florida Trail Association, a great group of cool folks from all backgrounds interested in hiking and exploring South Florida’s many wild and off-beat places. Held on on June 6th, it was the last hike of the season, and one that also celebrated National Trails Day! Tarpon Lake is located in the Big Cypress National Preserve Addition Lands, a short hike from the new parking and access point at Mile Marker 51 on I-75 aka “Alligator Alley”. Note that this is NOT a rest area and that there are NO facilities! It is a parking area with a boat ramp, trail heads and access to the L28 levee roads. The adjacent L28 Interceptor canal is a major feature of the very extensive SFWMD canal system. This vast network of canals, gates and pumps provides flood protection, water storage and irrigation for agriculture from Lake Okeechobee on south. It is what has enabled the 5+ million people to reside in South Florida, including myself. Unfortunately this system hasn’t done as well for the Everglades ecosystem in general, and has left some areas with too much water, and others with very little. Fixing the “plumbing”, along with making it work more effectively and ensuring good water quality is what the Comprehensive Everglades Restoration Plan (CERP) is all about! 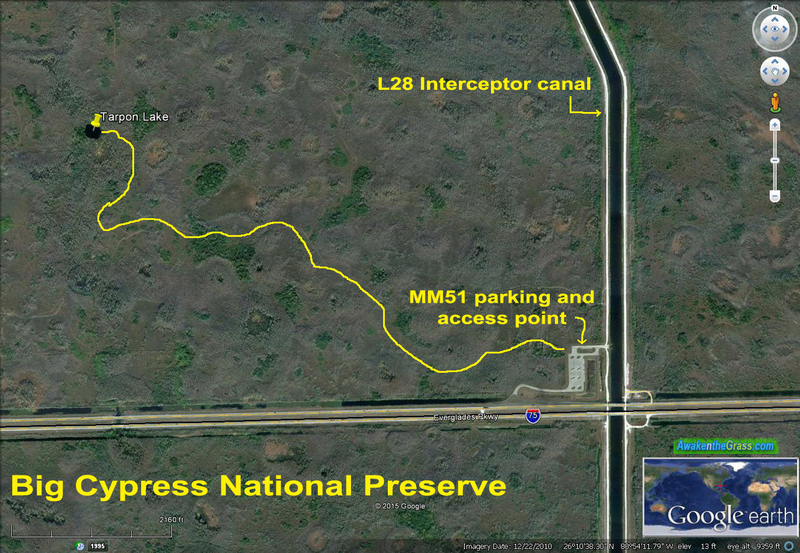 Approximate hiking route to Tarpon Lake from the MM51 access point on the L28 Interceptor Canal. Trailhead on the NW corner of the MM51 parking/access area. 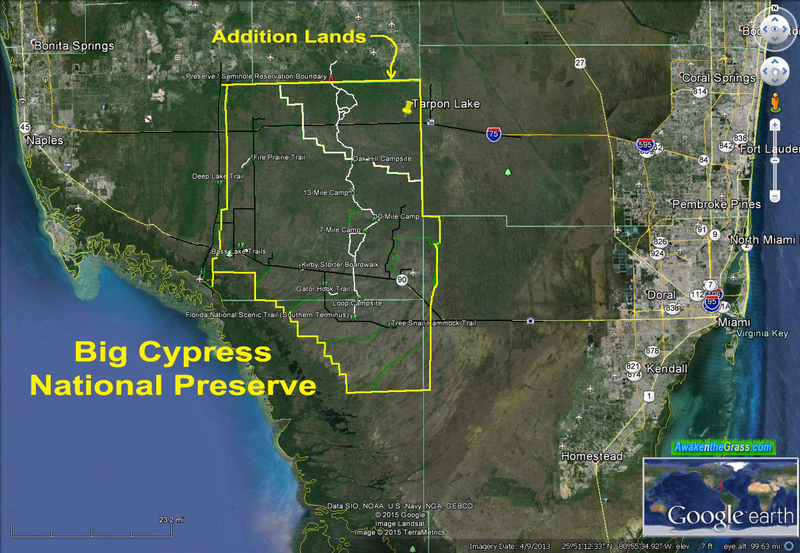 This section of Big Cypress, the so called “Addition Lands” (acquired in 1988 & 1996) has stirred up some controversy regarding the General Management Plan, as to who is going to get access and how . We should not forget that the Preserve was created only forty years ago with the combined efforts of environmentalists, hunters, conservationists, ORV users, hikers and others who wanted this land set aside and protected for future generations. Prior to the establishment of the Preserve, a giant international airport was already under construction, and a two mile runway survives to this day. Working together is the best way to maintain awareness of and support for Everglades restoration issues and challenges. Big Cypress is also vitally important to neighboring Everglades National Park. One of the first things we saw was this track left by a bear, maybe? A beautiful Bartram’s Rose Gentian flower on the trail. Along the trail, lots and lots of Butterfly Orchids this time of year! This was about eye level, looks to be a bird nest, maybe a hummingbird? This is the typical landscape in this part of Big Cypress. We hiked along marked hiking trails, old ORV trails and did some bushwacking to connect the dots. Remains of a very, very old glades buggy. Those look like old airplane tires on the rear axle on a custom rim. View from the front, it was a 2WD vehicle, maybe a Ford Model A? Dragofly view of hikers at Tarpon Lake. Closeup satellite view of final approach to Tarpon Lake. First glimpse of Tarpon Lake – a refreshing oasis in the woods. 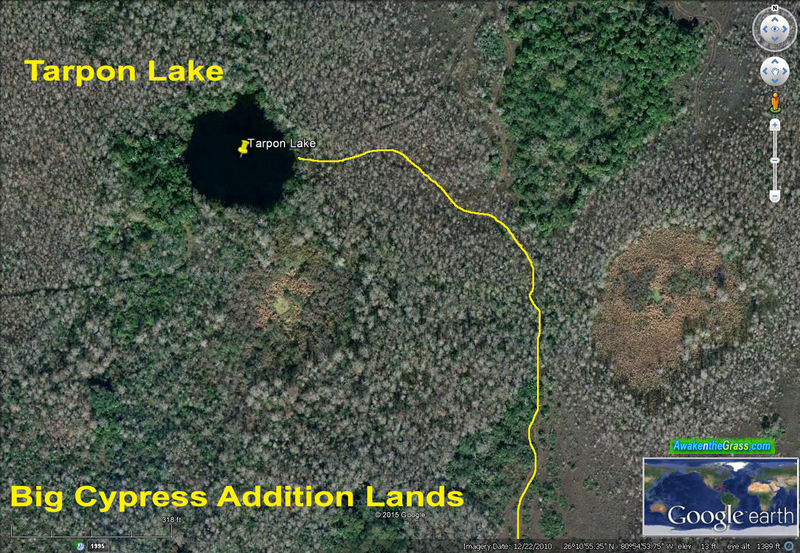 Tarpon Lake is a natural sinkhole that was created when the soft limestone rock collapsed on itself. It is about 50 to 60 feet deep, but I really doubt there’s any tarpon fish in there since it is landlocked. It was already a pretty hot day, even in the morning, so a brave soul decided to jump in to cool off. After giving George about 5 or 10 minutes, and seeing he was still alive, I could no longer resist and jumped in myself. Hikers to swimmer: you go in first! Are there alligators in there? None of the rest of our group would join us, but were ready to record anything! Yes, of course there are! My lifeguard training came in handy high treading this water. Cameron swims at Tarpon Lake. I love the reflection on this one! I took some liberties ..
.. with the photography* ! Tales from the dark depths*. Fishing for girls from the sky with the pole cam. Aerial view of Tarpon Lake in Big Cypress with gator bait, ehr I mean swimmers .. lol. Fishing in the sky for low altitude aerial photography! On the banks of Tarpon Lake, note the limestone! Sinkhole from underwater shows the limestone wall and ancient reef fossils of Tarpon Lake. The water gets very dark beyond five or six feet! This deep, dark mysterious lake, along with the subconscious terror represented by the gators reminded me of a powerful poem by the Czech author Karel Jaromír Erben. His book ‘Kytice z pověstí národních‘ (A Bouquet of Folk Legends) or just ‘Kytice‘ for short is a collection of poems based on traditional Slavic mythology and folk themes, long considered to be one of the most important works of Czech literature. In particular, one of the poems ‘Vodník‘ presents a malevolent creature called Vodník – a Water Goblin who lives at the bottom of a lake and traps drowning souls in his watery lair! The green Water Goblin is today a very popular garden ornament and the perennial boogeyman in Czech folklore. Just replace ‘Water Goblin’ with ‘Alligator’ .. that is the Florida Everglades analogy! ‘Vodnik‘ (aka green Water Goblin) is a part of Slavic mythology and Czech folk legend. Pictured here as a smokin’ garden ornament. Stay at home today, my daughter! The poem is partly about premonitions and presentiments, leading to questions about fate, love, control and darker aspects of human nature. It also inspired famous Czech composer Antonin Dvořák to create a symphonic poem piece: The Water Goblin (Vodnik) Op.107 . Hiking on a Big Cypress ORV trail near Tarpon Lake. Moving back onto dry ground, we hiked along what looked to be a well maintained ORV track and found skeletal remains of a deer fawn. Remains of a deer on the side of the trail. Not a Happy Hoofer: fawn hoof from the skeleton. Orchid pseudobulbs on a Big Cypress tree. Furry flora of Big Cypress. Back in color, this landscape is a great mix of reddish browns, greens and blues. Landscape of the Big Cypress Addition Lands. Esther spots some orchids growing on a branch. There is so much beauty in the details when you look around in Big Cypress! Beauty on the trail: Esther poses behind a Butterfly Orchid! Hikers photographing orchids on the trail. Cameron is what you might call an Orchivore! A small section of the trail led through an enchanted forest of sorts. All of a sudden, it’s just a stone’s throw to the parking lot. These beautiful orchids were all over the place, even within sight of the parking lot! One last Butterfly Orchid, just because! Check out some of my photographs that are available through: AwakentheGrass ART ! Back at the I-75 MM51 parking/access area. Satellite view of South Florida and Tarpon Lake in relation to Big Cypress National Preserve. © 2015 Flex Maslan / Awakenthegrass.com / kayakfari.com. All original photographs, artworks and music in this portfolio are copyrighted and owned by the artist, Flex Maslan, unless otherwise noted. Any reproduction, modification, publication, transmission, transfer, or exploitation of any of the content, for personal or commercial use, whether in whole or in part, without written permission from the artist is strictly prohibited. *The photographs depicting the girls swimming with the alligators are fictitious. They were created in the safety and comfort of my Photoshop. No girls, nor alligators were harmed in the making of this story. Alligators were present in the lake, but not anywhere near the portrayed proximity! For illustration purposes only! Do not try this at home nor in any lake! !